HOUSTON – They buried him in his No. 34 jersey, one week after he was murdered outside of his high school as students watched in disbelief. More than 1,300 mourners filled Antioch Missionary Baptist Church in Chicago two days before Christmas in 2002 to pay tribute to Maurice Davis, an 18-year-old honors student and college basketball prodigy fresh off a 38-point game. As the Rev. Jesse Jackson spoke from the pulpit about the senseless violence engulfing the city's South Side, Davis' friends and family members – many of them with airbrushed likenesses of Davis on their t-shirts – sobbed and rocked back and forth in the pews. On the front row, a couple of feet from the casket, 14-year-old DeAndre Liggins sat stone-faced. Just a few months after the death of his father, Liggins was now without a brother. In one tug of a trigger, he'd lost his best friend. "I felt," Liggins said, "like I was alone." Liggins puts his elbows on his thighs and stares at the carpet. More than eight years after Davis' fatal shooting following a schoolyard fistfight, Liggins is sitting in a conference room at Reliant Stadium in Houston, where his Kentucky basketball team is preparing for Saturday's national semifinal game against Connecticut. The Wildcats know they wouldn't be here without Liggins, whose late 3-pointer against North Carolina on Sunday catapulted Kentucky into its first Final Four since 1998. It's a stunning accomplishment for a team that features three freshmen among its top six players. But some would say the bigger surprise is that Liggins played such a big part in making it happen. Liggins, after all, has grown used to playing the underdog role. Not on the basketball court. The drugs and gang violence that surrounded Liggins each time he opened the door of his grandmother's apartment in the projects during junior high school … the academic issues that threatened to keep him from getting his degree … the rebellious attitude he displayed at Kentucky that was likely caused by the lack of male role models during his teenage years. All of it nearly kept Liggins from where he is now, on college basketball's biggest stage, the ultimate success story in a Final Four filled with players and teams who have beat the odds. "No one even thought this kid was going to graduate from high school," said Tommy Dobson, one of Liggins' coaches at Washington High in Chicago. "People told me I was taking a gamble by even letting him on the team. People said he would never make it. "I told him that when he was in the ninth grade. He just smiled and said, 'Oh, I'll make it. Watch me." Shortly after he committed to Kentucky four years ago, DeAndre Liggins texted former Wildcat Ramon Harris and asked if he'd mind giving up his No. 34 jersey. Liggins wanted to honor his brother. 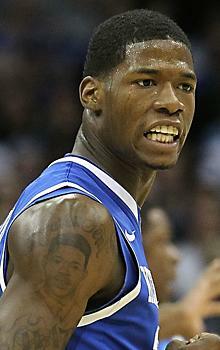 Harris obliged and, soon after enrolling in Lexington, Liggins had Maurice's image tattooed on his right shoulder. Each time he swishes a 3-pointer, makes a steal or dives for a loose ball – a Liggins trademark – the junior guard said he feels his brother looking down on him from heaven. "When he died," Liggins said, "I felt like I had to carry on his dream. This is what he wanted to do. I'm living his dream for him. Hopefully I'm making him proud." "Proud" is what Liggins always was of Maurice as the two were growing up in Chicago. At night, after the brothers had torn up the miniature basketball goal they bought at the dollar store, Maurice would bend a wire coat hanger into a circle and attach it to the top of a closet door. A rolled up sock wrapped in a rubber band made for a perfect basketball. "He'd beat me over and over again and I'd just start crying," Liggins said. "He told me all that crying wasn't going to do me any good. Once I stopped, he showed me little things to do to help me win." Maurice was attracting attention from Division I basketball programs such as Miami, Kansas and Northwestern after growing four inches – he was 6-foot-5 at the time of his death – before his senior year. One of the most well-liked students in school, Maurice often tutored classmates in his spare time and was known for being especially nice to the special education students who were struggling to fit in. But on the afternoon of Dec. 16, 2002, Maurice became incensed upon learning of an incident between his 17-year-old sister, Tempestt, and an ex-boyfriend. Upset that Tempestt had ended their relationship, Xavier Edwards, 16, allegedly choked Tempest in a hallway and pushed her into a wall. With a crowd looking on, Maurice and some of his friends confronted Edwards after school and attacked him with a flurry of punches. A friend handed Edwards a gun and he shot at both Maurice and Tempestt, who was wounded in the leg. Maurice was hit in the back as he tried to flee. According to reports, Edwards stood over Maurice as he lay bleeding on the ground and tried to pump more bullets into him. But he had already used all five bullets, so amid the shrieks of onlookers was the clicking of a trigger being pulled over and over again. Maurice died about an hour later at a local hospital. Edwards was convicted of second-degree murder and aggravated battery with a firearm. He was sentenced to 30 years in prison. Maurice's death was tough on everyone, but it was especially difficult for Liggins, whose father had died after going into a diabetic coma months earlier. "I was the only guy left in the family," Liggins said. "It's great to have a sister to talk to. But having a brother there is like a whole different degree. I missed him." Instead of letting the situation get the best of him, Liggins found refuge on the basketball court. Until then Liggins had been nothing more than a streetball player, a guy with eye-popping talent whose skills would likely be limited to Chicago's blacktops instead of high school and college gymnasiums across the country. "I figured my brother was the one doing it all basketball-wise, so I didn't need to," Liggins said. Liggins was a star from the get-go at Washington High School, where he played three seasons before transferring to Findley Prep in Nevada. "DeAndre had friends who were involved in all kinds of negative things … gangs, drugs," Dobson said. "But he avoided all of that stuff by spending his time in the gym." Asked Thursday what would've become of his life without basketball, Liggins said he would've ended up like his cousins. "They're just in the streets, hanging out, doing nothing with their lives," Liggins said. By the end of his junior season, the 6-foot-6 Liggins – his father was 6-8 – had offers from some of the country's top programs. He eventually chose Kentucky over a list of finalists that also included Memphis, Kansas and Illinois. It was a proud moment for Liggins and his family. Although he maintained a relationship with his mother, Liggins lived with and was raised by his grandmother. "Some people get used to where they live," Tempestt Liggins said. "They get used to the negativity and they become a part of it. But us … we pushed against it. DeAndre saw the downfalls and didn't let them get to him." Liggins arrived at Kentucky convinced he'd have a chance to make an immediate impact under second-year coach Billy Gillispie. His enthusiasm was quickly squelched. Gillispie had a "tough love" approach that didn't sit well with Liggins, who wasn't used to being yelled at or pushed in such an intense fashion. Gillispie often kicked Liggins out of practice and told him to leave his jersey behind. Instead of letting the criticism motivate him and make him stronger, Liggins rebelled. Liggins once refused to enter a game when Gillispie attempted to sub him in, and he also developed a habit of talking back to the coaching staff. Skipping class was also a regular occurrence. Kentucky's staff tried calling Liggins' grandmother in hopes that she could get through to him. Liggins said she wrote him letters in the mail each week, begging him to change his attitude. But the pleas fell on deaf ears. "I thought I could do it my way," Liggins said. "That wasn't the case. I had to listen to the coach. I didn't do that my freshman year. When things didn't go my way I was mad. It was part of me growing up." Dobson, Liggins' high school coach, said: "He didn't understand that [Gillispie] was trying to get him ready for life. I told him, 'This isn't just about basketball. It's about something much deeper than that.' But he couldn't catch on quick enough." Liggins was excited about getting off to a fresh start after Gillispie was fired following his freshman season, but new coach John Calipari – who had recruited Liggins when he was at Memphis – suspended Liggins for the first nine games of the 2009-10 season for an undisclosed violation of team rules. Kentucky's team was full of players with vivacious personalities such as John Wall and DeMarcus Cousins. Liggins, though, was often viewed as aloof. Always known as shy and soft-spoken, Liggins didn't spend much time socializing with his teammates away from the court. At practice, if the Wildcats were shooting on one basket, Liggins would take shots on the other. Just as Gillispie had done the previous year, Calipari urged Liggins to come out of his shell and become a better teammate. It wasn't always an easy sell. "Think about it, though," Calipari said. "I'm sitting here telling him to worry about his teammates, when for most of his life it's been all he can handle just to worry about himself." Those close to Liggins said his biggest problem was trust. He liked Calipari and Gillispie but he had a difficult time truly accepting them as mentors and role models – at least early on. Deep down he longed for someone to confide in, someone he truly respected to set him straight. "Some of the stuff I did, I would've never done if my brother was still here," Liggins said. "He'd have been the guy to get in my ear and say, 'What are you doing? Listen to your coach. Do the right thing.'" Eventually, Liggins did begin heeding Calipari's advice. He averaged just 3.8 points in 15 minutes per game as a sophomore last season but, by the end of the year, Liggins had blossomed into one of Kentucky's top defensive players. He was a "glue-guy" who rarely committed a turnover and often came up with a crucial rebound or steal. Slowly but surely, Calipari became more and more comfortable leaving him in the game. "I love him to death," Calipari said Thursday. "I love him like a son, and I think he looks at [the coaches] and says, 'I trust these people,' and probably for the first time in his life he's saying, 'You tell me what you want me to do, and I'm going to do it. I trust you.' "
Liggins' success on the court helped improve his mentality off of it. He began hanging out with his teammates more and has been more open and jovial with fans and media. "It wasn't that I didn't like my teammates," Liggins said. "I just had a lot of things stored up inside of me and I didn't open up. When you're quiet it's tough for people to understand you and what you're thinking. This year, I decided to talk more to people. I'm glad people are getting to know me for who I really am." With Kentucky losing five players to the NBA draft last spring, Liggins is now one of the top all-around players on the Wildcats' roster. He may not be a future first-round NBA draft pick like Terrence Jones or Brandon Knight. And he's not a ham like Josh Harrellson. But there aren't many players in college basketball who make as many hustle players as Liggins, who averages 8.8 points and 2.5 assists. Liggins has scored in double figures in four of his last six games. Tempestt, who recently graduated from Malcolm X College in Chicago, couldn't be any more proud of her brother. "DeAndre is comfortable with who he is now," said Tempestt, 25. "I always told him, 'Whenever your time comes, you're going to be able to sit back and say, 'I didn't have my dad. I didn't have my brother. But I had myself.'" Because he plays for a high profile team filled with NBA players, Liggins' talents are often overlooked. Scouts, however, love 6-foot-6 athletes with point guard skills and a passion for playing defense. If Liggins doesn't make it in the NBA, he almost certainly could earn a significant amount of money playing overseas. "I'm just happy right now," Liggins said. "I'm going in a good direction. I'm in school. My sister graduated from college last year and I'm on the verge of doing that, too. I'm doing all the right things." That includes making that big 3-pointer Sunday against North Carolina. So happy was Calipari that he kissed Liggins on the forehead as he made his way to the sideline. For a guy that was once criticized for not smiling enough, Liggins' grin spanned from cheek to cheek. A few minutes later, Liggins and his teammates stood on a stage at midcourt and accepted the East Regional championship trophy. Liggins was named to the all-tournament team, and as the Wildcats began to pump their fists toward the crowd and look ahead to the Final Four, Liggins turned away. "I don't know if anyone noticed it," he said, "but I started tearing up. I was thinking about where I've been and where I've come, and I was speechless. After everything, there I was, making a big shot to put us in the Final Four. "I still can't believe it."